Close up of the original plate. With the enhanced version as a guide the major elements of the scene can just be discerned. 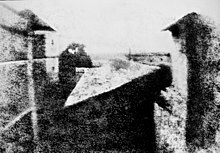 View from the Window at Le Gras is a heliographic image and the oldest surviving camera photograph. It was created by French inventor Nicéphore Niépce in 1826 or 1827 at Saint-Loup-de-Varennes, France, and shows parts of the buildings and surrounding countryside of his estate, Le Gras, as seen from a high window. Niépce captured the scene with a camera obscura focused onto a 16.2 cm × 20.2 cm (6.4 in × 8.0 in) pewter plate thinly coated with Bitumen of Judea, a naturally occurring asphalt. The bitumen hardened in the brightly lit areas, but in the dimly lit areas it remained soluble and could be washed away with a mixture of oil of lavender and white petroleum. A very long exposure in the camera was required. Sunlight strikes the buildings on opposite sides, suggesting an exposure that lasted about eight hours, which has become the traditional estimate. A researcher who studied Niépce's notes and recreated his processes found that the exposure must have continued for several days. In late 1827, Niépce visited England. He showed this and several other specimens of his work to botanical illustrator Francis Bauer. View from the Window at Le Gras was the only example of a camera photograph; the rest were contact-exposed copies of artwork. Bauer encouraged him to present his "heliography" process to the Royal Society. Niépce wrote and submitted a paper but was unwilling to reveal any specific details in it, so the Royal Society rejected it based on a rule that prohibited presentations about undisclosed secret processes. Before returning to France, Niépce gave his paper and the specimens to Bauer. Niépce died suddenly in 1833, due to a stroke. After the pioneering photographic processes of Louis Daguerre and Henry Fox Talbot were publicly announced in January 1839, Bauer championed Niépce's right to be acknowledged as the first inventor of a process for making permanent photographs. On March 9, 1839, the specimens were finally exhibited at the Royal Society. After Bauer's death in 1840 they passed through several hands and were occasionally exhibited as historical curiosities. View from the Window at Le Gras was last publicly shown in 1905 and then fell into oblivion for nearly fifty years. Historian Helmut Gernsheim tracked down the photograph in 1952 and brought it to prominence, reinforcing the claim that Niépce is the inventor of photography. He had an expert at the Kodak Research Laboratory make a modern photographic copy, but it proved extremely difficult to produce an adequate representation of all that could be seen when inspecting the actual plate. Gernsheim heavily retouched one of the copy prints to clean it up and make the scene more comprehensible, and until the late 1970s he allowed only that enhanced version to be published. It became apparent that at some point in time after the copying in 1952, the plate was disfigured and acquired bumps near three of its corners, which caused light to reflect in ways that interfered with the visibility of those areas and of the image as a whole. During the 1950s and early 1960s, Gernsheim lent the photograph to several exhibitions in continental Europe. In 1963, Harry Ransom purchased most of Gernsheim's photography collection for the University of Texas at Austin. The Niépce heliograph was not included in the sale, but shortly afterward Gernsheim donated it. Although it has rarely traveled since then, in 2012–13 it visited Mannheim, Germany, as part of an exhibition entitled The Birth of Photography—Highlights of the Helmut Gernsheim Collection. It is normally on display in the main lobby of the Harry Ransom Humanities Research Center in Austin, Texas. During a study and conservation project in 2002–03, scientists at the Getty Conservation Institute examined the photograph using X-ray fluorescence spectroscopy, reflectance Fourier transform infrared spectroscopy, and other techniques. They confirmed that the image consists of bitumen and that the metal plate is pewter (tin alloyed with lead, as well as trace amounts of iron, copper, and nickel). The Institute also designed and built the elaborate display case system that now houses the artifact in a continuously monitored, stabilized, oxygen-free environment. In 2007, scientists from the Louvre Museum published an analysis of the photograph using ion beam analysis, with data taken on their 2 MV electrostatic accelerator. This showed the details of the oxidation process that was corroding the image. In 2003, Life listed View from the Window at Le Gras among 100 Photographs that Changed the World. ^ "First photograph, View from the Window at Le Gras, Joseph Nicéphore Niépce, ca. 1826". University of Texas at Austin. Retrieved May 20, 2017. ^ a b c "The First Photograph". Harry Ransom Center. Retrieved 2012-01-14. ^ Niépce and the Invention of Photography - Nicephore Niepce House Photo Museum. Retrieved 5 May 2016. ^ Lowry, Bates and Lowry, Isabel Barrett (1998). The Silver Canvas: Daguerreotype Masterpieces from the J. Paul Getty Museum. The J. Paul Getty Museum, Los Angeles. p. 213, note 51. ^ The Harry Ransom Center: The First Photograph: History. Retrieved 27 May 2013. ^ The Harry Ransom Center: The First Photograph: Exhibition history. Retrieved 6 March 2015. ^ Analyzing the world's first photograph. Precious image studied at Getty Institute in Los Angeles. Archived June 15, 2012, at the Wayback Machine National Public Radio, April 7, 2002. Retrieved August 26, 2008. ^ Brown, Barbara (2002). "GCI/HRC Research World's First Photograph". Abbey Newsletter, 26:3 (November 2002). Retrieved 15 March 2015. ^ Harry Ransom Center, The University of Texas at Austin. The first photograph: conservation and preservation. Retrieved August 26, 2008. ^ "Towards truly simultaneous PIXE and RBS analysis of layered objects in cultural heritage". Nuclear Instruments and Methods in Physics Research Section B: Beam Interactions with Materials and Atoms. 261: 426–429. 2007-08-31. arXiv:0707.2448. Bibcode:2007NIMPB.261..426P. doi:10.1016/j.nimb.2007.04.259. ^ "100 Photographs that Changed the World". The Digital Journalist. Retrieved 2012-01-14. Wikimedia Commons has media related to View from the Window at Le Gras.